Steph Curry takes his shot during a putting contest with Augusta National Women's Amateur players. Golden State Warriors’ star Steph Curry is always game for a little golf, even after practice. 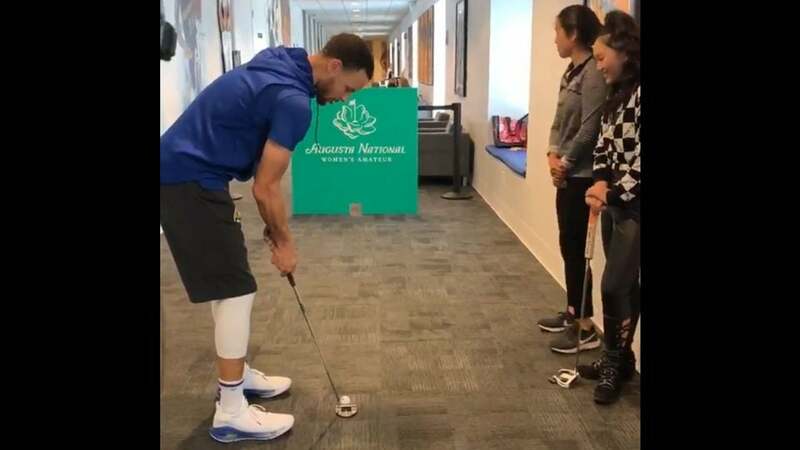 On Thursday, the perennial NBA MVP candidate took on two invitees to the inaugural Augusta National Women’s Amateur in a hallway putting contest. The Augusta National Women’s Amateur kicks off the week before the Masters, and among the 72 top amateur invitees are 16-year-old phenom Lucy Li and Stanford golf standout Andrea Lee. The two star golfers took a trip to the Warriors practice facility in the Bay Area this week to promote the upcoming event. They brought with them a green backboard with the Augusta National Women’s Amateur logo and a hole cut at the bottom with the intention to have an impromptu putting contest. Fresh out of practice, Steph Curry was willing as ever to put his golf skills to the test against some of the best golfers around. So, the trio plopped the putting board down in a hallway and had themselves an old-fashioned putt-off. Check it out below. Each player made one roll, with Li and Lee narrowly missing their tries. Curry went last and displayed his trademark clutchness with a perfect roll, followed by an even better celebration. Here’s another angle with a better look at the celebration. The result isn’t entirely shocking when you consider that Steph Curry is an accomplished golfer himself. He’s competed in two Web.com events over the last two years. At last year’s Ellie Mae Classic, he opened with an impressive 71, before faltering on Friday with an 86 to miss the cut. Curry also admitted last year that he played golf during the NBA Finals. He even credited his golf mentality for calming his nerves before Game 7 of the Western Conference Finals in 2018. That being said, his two competitors are among the best amateur golfers in the world. Li became the youngest qualifier in the history of the U.S. Women’s Open in 2014 at just 11 years old. Lee is a Stanford junior who was a first-team All America last year and has competed in several LPGA Tour events, including the U.S. Women’s Open. The Augusta National Women’s Amateur kicks off April 3. Following the first two rounds, the top 30 players will advance to the final round on the hallowed grounds of Augusta National.